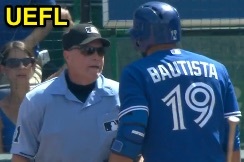 HP Umpire Jerry Meals ejected Blue Jays DH Jose Bautista for arguing a balk no-call in the top of the 8th inning of the Blue Jays-Royals game. With two out and one on, Bautista took a 1-1 cutter from Royals pitcher Wade Davis for a called second strike before fouling the subsequent pitch delivered from Set Position. Replays indicate the 1-1 pitch was located over the inner edge of home plate and belt high (px -.934, pz 3.139) while Davis appropriately came to a stop after the stretch before delivery of the 1-2 pitch, the call was correct. At the time of the ejection, the game was tied, 10-10. The Royals ultimately won the contest, 11-10. This is Jerry Meals (41)'s first ejection of 2015. Jerry Meals now has 2 points in the UEFL Standings (-2 Previous + 2 MLB + 2 Correct Call = 2). This is the 126th ejection of the 2015 MLB Regular Season. This is the 60th player ejection of 2015. Prior to ejection, Bautista was 1-4 in the contest. This is the Blue Jays' 6th ejection of 2015, 2nd in the AL East (BOS 7; TOR 6; BAL, NYY 4; TB 3). This is Jose Bautista's first ejection since August 24, 2014 (Bill Welke; QOC = Y [Balls/Strikes]). This is Jerry Meals' first ejection since June 1, 2014 (Anthony Rizzo; QOC = N [Balls/Strikes]).